The first trailer and poster for the action film "Heist" have been released. Directed by Scott Mann ("The Tournament"), the film stars Jeffrey Dean Morgan and Dave Bautista as partners in a casino heist that falls apart when their getaway is compromised. Forced to hijack a bus, the crew must not only evade the cops, but also The Pope (Robert De Niro), the gangster owner of the robbed casino. The story seems to be on the B-flick ridiculous side, like a mash-up of "Ocean's Eleven" and "Speed", but the trailer looks pretty good, all things considered. The film also stars Kate Bosworth, Gina Carano, Mark-Paul Gosselaar, D.B. Sweeney, Lydia Hull, and Morris Chestnut. "Heist" will be available in theaters (limited) and On Demand starting November 13th. Check out the trailer and poster after the jump. 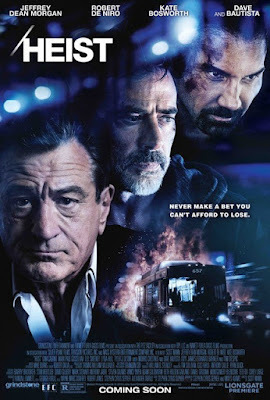 "When their attempt to rob a casino owned by the feared gangster Pope (Robert De Niro) goes awry and a shootout ensues, Vaughn (Jeffrey Dean Morgan) and Cox (Dave Bautista) are forced to flee on foot and hijack city Bus 657 and take the passengers hostage. Now, in a high speed chase, Vaughn will not only have to outwit the police, led by Officer Bajos (Gina Carano) who are in hot pursuit, but he will have to contend with Pope’s maniacal right hand man, Dog (Morris Chestnut), in order to make it through the day alive. But we quickly learn that things are not what they seem, and Vaughn has more than one card up his sleeve."